Distinta Relazione dell’infame Vita, ed obbrobriosa Morte dello scellerato Ebreo Gioseffo Suss nella città di Stutgard. Illustrated title-page. pp. 4. Paper repairs, loss of several words on second leaf. Modern calf-backed boards utilizing older patterned paper. 8vo. 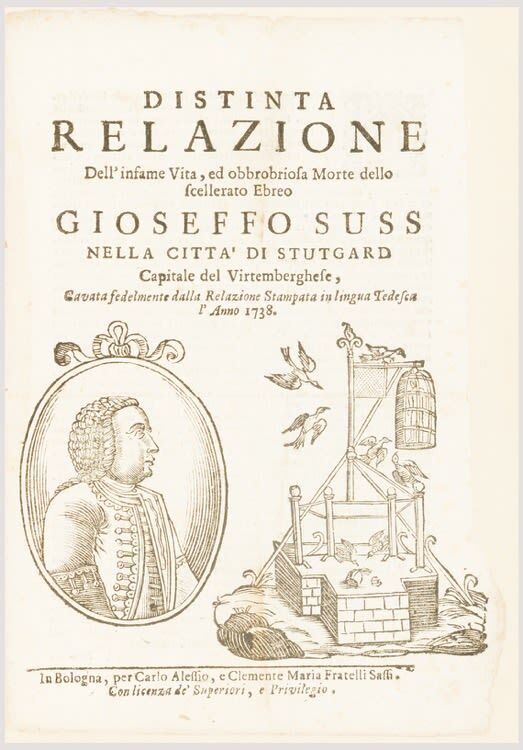 Bologna: Carlo Alessio, et al, n.d.
Joseph Süss Oppenheimer (1698-1738) was Court Jew and confidential financial advisor to the Duke of Württemberg. Exercising his authority in an autocratic fashion and seeking to establish absolute rule, Oppenheimer aroused fierce opposition to his authority. When the Duke, his protector, suddenly died, Oppenheimer was arrested and subsequently hanged on April 2nd 1738, his body publicly exhibited in an iron cage.